Water. It is one of the essentials. As anyone who’s made the mistake of not bringing adequate drinking water with them in the woods can attest to, being prepared to easily filter and purify water is a necessity in any survival scenario. Luckily, filtration is possible with readily available, natural materials using a DIY filter. What is a filter? It relies on water moving through successively smaller gaps in layers of materials, stopping sediment and particulates in each layer. Eventually the water passes through the smallest gaps, pores in activated charcoal, and emerges filtered and ready for purification by boiling or other methods. Remember that filtration by itself does not make water safe to drink, but is a crucial first step to being prepared in case of water scarcity. 1. Gravel. This will be the material with the largest pores, filtering the largest contaminants. This prevents the twigs, stems, leaves and other typical debris, you’d find in water taken from a natural source, from potentially blocking the finer grain filter layers below. 2. Sand. This acts a lot like the gravel, only on a smaller scale. Small pieces of bark, grit, and larger particles will be stopped as the water passes through this layer. 3. Activated charcoal. A good source of this is a campfire. Build a large coal bed under the fire, bury it and wait. As the fire burns, the charcoal develops ultra-fine pores as it is exposed to oxygen. Several days later, unbury the coal, confirm they’re cooled, and take the coals. You’re actually going to want to pack the charcoal as tight as possible into the container later so it helps to crush the coals at this point because the finer the activated charcoal, the better for filtration. 1. Find a container. There’s some leeway with what the actual filter is built inside of. It needs to be sturdy enough to support the gravel and sand inside of it and it needs to be food safe. Examples of great containers are five-gallon food buckets from restaurants, glass and plastic soda bottles, and coffee tins. Make sure you can easily modify the material the container is made of (especially in the case of brittle materials like clay or ceramic) and that it is definitely food safe (avoid plastic containers not explicitly for food or drink). Cylinder-shaped containers will provide the most even flow, and are preferred. 2. Punch a hole in the bottom of the container so the water can flow through. This hole does not need to be large. The ideal filter will only have a slow drip of water coming out of it. 3. Place a coffee filter or some loose grass over the hole, and now you’re ready to pack the filter with your materials. The coffee filter will prevent the charcoal from passing through the drain at the bottom of the container. Grass can work also, because the water will be purified after anyway. 1. Rinse the gravel, sand, and charcoal to remove unwanted dirt and silt from the materials before they are packed in the container. The filter is still effective, without rinsing, but it will reduce the filter’s lifespan. If you don’t rinse first, you will definitely need to run a few gallons of water through the filter before even attempting to use the water for something potable. 2. With the coffee filter over the hole in the container, pack the charcoal in as tightly as you can, about one-third of the way up. You only want a slow drip of water. If the water flows steadily out, you’ll need to pack it tighter. This helps to cleanse bacterial contamination and captures ultra-fine particulates, so it’s a win either way. 3. Next, add the layer of sand. If you’re lucky enough to have different grades of sand, pack in the fine sand first, working up in grade to the coarsest. The sand should also fill about a third of the container, like the charcoal. 4. Finally, add the gravel on top. Like with the sand, if you have multiple sizes of gravel, try to get it from finest to coarsest. Leave yourself about an inch or two of space from the top edge of the container. This will prevent water from overflowing if it drains slower than expected. After you’ve added the gravel, the filter is ready to go. If you didn’t rinse the gravel and sand well, you will want to run some junk water through now just clear out any loose silt. Getting this out of the way beforehand will lead to a better filter. As said earlier, this type of process will filter out contaminants. The water still needs to be purified before drinking. This filter will take care of the larger things you’ll typically find in water sources: bugs, pieces of plant, silt and dirt, and grit. If the charcoal is packed tight enough, it will help remove some bacteria. It won’t remove all bacteria, though, and viruses are too small for it to effectively block. Also, although the charcoal may absorb some chemical contamination, it will definitely not absorb the majority of it. You will need to boil the water or use another method to further purify it before drinking. Humanity has done a great job of tainting a lot of nature. If you’re worried about chemical contamination, then find another water source. It is not worth the risk. Now that you’ve got your filter and a water source you’re confident about, it’s time to start. 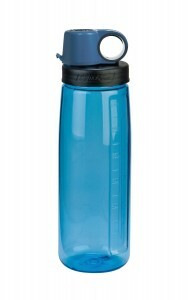 You’ll need a food safe container to catch the water as it comes out of the hole you made in the bottom of the filter. Ideally, it should be something the filter can rest on top of. Water filtration is a very slow process and you don’t want to have to hold the filter while it happens. Jars, jugs, and BPA-free plastic water bottles are all good choices, but an empty soda bottle or can works just as well. A good alternative for a more permanent site is attaching pipe and fittings to the bottom that act as a dripping spigot. Attach a valve if available but be careful not to leave it closed with water in the filter for an extended period. Slowly pour the water through the top. The only thing to watch out for now is the water overflowing the top edge. This shouldn’t happen if you’re patient and left enough room at the top when you added the gravel. After the first use you should be able to judge the right amount of water to add at a time, and how fast to fill it. The water will slowly move through the gravel, sand, and charcoal, eventually dripping out the bottom into the second container. After it has all passed through, check the clarity or the water. If you’re not happy with it, you can filter it through again, repeating as many times as necessary to get it as clean as desired. Then it is ready to be purified. The filter will eventually need to be replaced as it gets clogged and the filtered water stops being as clear as you want. It happens and it’s a good thing, it means the filter did its job. When it’s no longer working well enough, you can empty, clean, and repack the container as before. For a more permanent DIY filter, like at a cabin or BOL, scale up by piping multiple containers into each other. Separate containers for the gravel, sand, and charcoal will make repacking easier and allow a lot more water to be filtered at once with less filling. Stack the containers, or put one over the other so water can still be pulled through by gravity. After the water’s filtered there are a bunch of different ways to purify it. Two of the most common ways of doing it are boiling and water purification tablets. Ultraviolet purifiers are also pretty popular. Each method has its own strengths and weaknesses so research these. DIY filters are a great way to keep your water clean in a pinch. There’s never a guarantee that a pre-made filter will be available, especially if you’re stuck and need to bug out at a moment’s notice. Using readily available gravel, sand, and charcoal you can make sure that clean water is one less thing you need to worry about. Do you use any alternative methods to filter your water and keep it clean at your site or retreat? Share them with us below! Are you sure? Most hardwoods but fully charred wood soft or hard is better than nothing. as long as it not from the few toxic/irritating woods. Once U have filtered out the dirt, there are three things what can still go wrong with water: C (Chemical), B (Biological), and R (Radiological). C can be poisons, and water-soluble poisons are going to be filter-resistant. I know how to deal with SOLID cyanide (Symptoms: Rotten taste, like rotten peanuts, and an instant feeling of being very drunk, because the cyanide is damaging your brain cells fast!). I grabbed a bottle of vinegar and drank one ounce immediately. I started burping. I went out to fresh air and backed away from the burps, which were cyanide gas, like what is used in the gas chambers. I don’t know how to deal with cyanide gas, except to get away from it, and go to fresh air. The drunk feeling went away fast. A little more vinegar to make sure i was rid of the cyanide. I would rather to overdose on vinegar than cyanide. I think that Calcium Disodium EDTA works on heavy metals, like arsenic, lead, and mercury, and the EDTA works slowly. I don’t remember anything about other chemical poisons. B are the germs which we are filtering out. R is radioactive Iodine. KI (potassium iodide) pills are used to block out the radioactive iodine from your glands. Take the KI pills only when radioactive fallout is present. And, U need to get the KI pills BEFORE TSHTF. In the worst of cases, think C-B-R when purifying water.